This easy recipe for sheet pan bacon and eggs is a great way to fix breakfast or brunch for a crowd. The sweet potatoes and onions round out this healthy meal. I am a huge fan of sheet pan dinners and I know lots of you are too, because my sheet pan recipe for One Pan Chicken and Vegetables is so popular on this blog that we turned it into a video (check out my video player on the right sidebar). So I figured, what’s good for dinner should be good for breakfast and brunch too, right? Right? And what better place to start my breakfast sheet pan adventures than with our old friends bacon and eggs. 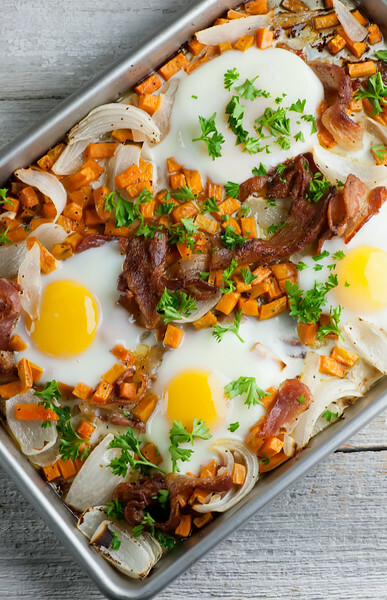 This easy peasy recipe is a great way to cook up a whole mess of bacon and eggs along with some healthy and handsome sweet potatoes, and with exactly one plan to clean up at the end, it’s also good for those days when you just can’t deal with cleaning up the kitchen. Ready to sheet pan your breakfast? Let’s make it! I had one of those days myself last week. I was running in to work, trying to juggle my briefcase and my lunchbox and my id card, and I should tell you at this point that our building has a beautiful lobby. It’s a landmark building, it was where the first transatlantic telephone call was made, and it includes 3 marble steps in between the door and the main lobby. So in the midst of trying to do 3 things at once that morning, the main thing I achieved was to trip and fall on those steps, scaring the poor security guard out of her wits and apparently landing with my full weight completely on my left ring finger. The first thing I felt was completely embarrassed, and I did that “I’m okay!” thing you do when you fall in front of an audience. The second thing I felt was OW. 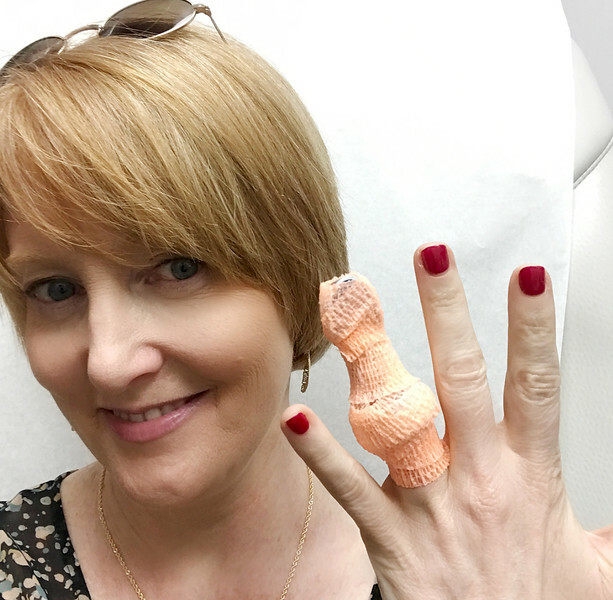 By the time I got upstairs, I had regained my senses enough to take off my wedding and engagement rings just in case my finger, which was at Defcon One (that’s the bad one, right?) in terms of ouch. However, I had not regained enough sense to actually go have someone look at it until I woke up the following morning and it was a lovely shade of purple. At which point I decided to become a responsible adult and go to the Urgent Care near my building. At this point I need to give a shout-out to the folks at CityMD on Fulton Street in NYC. 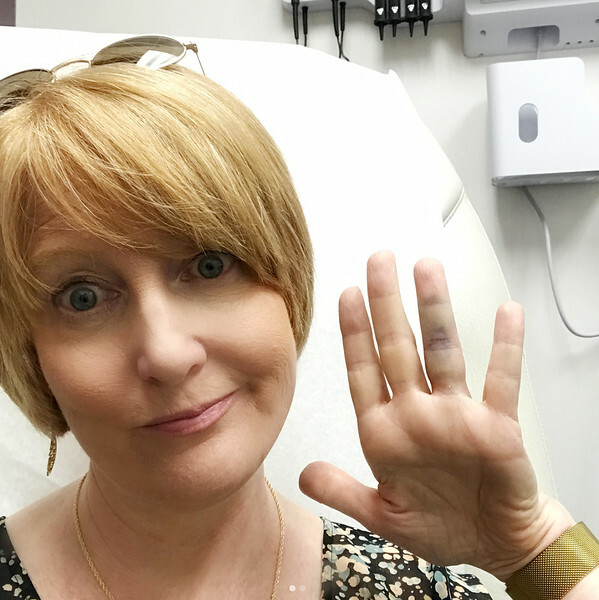 They were so incredibly nice, and whisked me away to get x-rayed, told me I was sprained but not broken, splinted my finger, and gave me a choice of red, green or orange tape. ORANGE OF COURSE. Because, go Clemson Tigers! And it happened to match my dress. It’s days like this where not only do you want breakfast for dinner, but you want it to include lots of bacon and very little cleanup, so enter this sheet pan bacon and eggs. You cook up a pan-full of diced sweet potato and sweet onion and all the bacon you can handle, and during the last 5 minutes or so of cooking you crack in some eggs, and you eat the whole thing while keeping your left hand elevated because that’s what the wonderful Dr. Katz at CityMD told me to do. The elevating the hand thing, not the cooking sheet pan bacon and eggs thing. Oh and PS, taking off my wedding ring temporarily did give me the chance to sing “All The Single Ladies” to the Southern husband, who has been the soul of patience through this whole saga. Whew! Line a rimmed baking sheet with nonstick foil and preheat oven to 400 degrees. Separate the bacon and arrange it in any design you like on the baking sheet. Sprinkle on the diced sweet potato and the onion. Push aside the ingredients so that you have a little space for each egg. Roast for about 40 minutes, or until the bacon is crispy and the sweet potato is tender. Remove the baking sheet from the oven. Carefully crack an egg into each of those little spaces you made and return the baking sheet to the oven to cook the eggs. I like my eggs soft set so I cook them for about 5 minutes – leave them in for a little more if you like them firmer. Divide the bacon, eggs and veggies among plates, sprinkle with salt and pepper and parsley and serve. For you Whole 30 folks out there, use sugar-free bacon for this one. Applegate Farms makes a great one – I’ve found it at Fresh Market. That move was almost as good as the Southern Husband’s stunt a year or so ago of falling UP the stairs and doing a number on HIS hand. 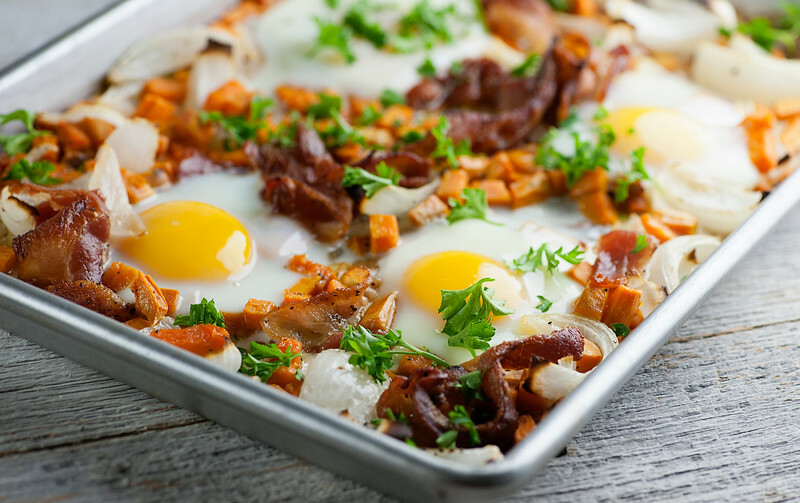 :) This sheet pan breakfast looks amazing. And wouldn’t you know it; lucky me on Friday the 13th has ALL the necessary ingredients at home! Winner, winner, bacon & eggs sheet pan dinner! Happy Friday, Kate! Ha! There have been a bunch of cracks (no pun intended) about this family’s tendency to fall UP! Hope you had a lovely sheet pan dinner! I made 2 sheet pans fuil of this deliciousness and my family gobbled it ALL down! This looks so good. Sorry about your finger. I went flying across the room at my Chiropractors because my sandal didn’t turn with me and landed on my shoulder and heard it break. I had a clean break and no surgery but had to wear the sling and have therapy(physical). The last time I broke this same shoulder was when I was 5 and on my horse. He started running and I wanted off so I thought well, Hopalong Cassidy (you are too young to remember him from the 50’s) does this all the time and he never gets hurt so I jumped off. Unfortunately, I broke my shoulder and when my Daddy removed my T-shirt, he sat my shoulder and I didn’t have to have surgery. Now for the food question. I don’t like sweet potatoes, can I use white potatoes and would it be better in Russet or the other white one? How bout Tater Tots or frozen hash brown patty chunks? You could try those – my concern would be that frozen Tater Tots are going to cook faster than potatoes would. But it’s worth a try! What about all the bacon grease? How does that work into the meal? Does it need drained prior to the eggs going in? Thank you! Well I just love this! Thanks, Captain Pete! What size sheet pan are you using? The inside dimensions of mine are 12×17 and it sure looks like it would hold at least 6 eggs & the veggies! Thanks!